Kill the Living Eat Their Brains! Braaiiinns! It's the sickest, silliest Munchkin yet! You are zombies, kicking down doors and eating brains. 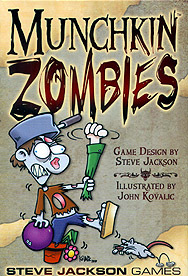 The "monsters" you're attacking are people, some helpless and some hazardous, with a few rogue zombies thrown in. The armour is whatever you've blundered across during your lurching search for brains. So bravely you'll go forth, with mousetraps on your feet and bowling trophy protecting your poor rotting head... to level up, or to die. Again. Includes 168 cards with full-colour art.